Picked up hubby at his office and we decided to hang around Gardens to grab dinner before heading home. Our usual dining spots were either full (meaning long queues like Hokkaido, Sushi Zanmai, Fong Lye or Din Tai Fung) or we were kind of tired of going again to the same spot though easy to get seats most of the time: Alexis. Decided to be adventurous and we headed to someplace which we ignored for a long time now. Italiannies. First off, I am curious why the spelling has an "e" in it. 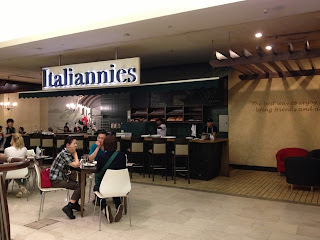 In the Philippines, they have Italianni's as well but without the "e". The menus are almost the same, even the name of the desserts! I wonder if it was a franchise gone sour and they decided to uphold the name and just change it a bit with an "e" (just my own imaginary, made-up conclusion). I guess the most important thing really is to see if the food is good. Whether or not it is the same group or franchise, let's see if it is worth the visit. 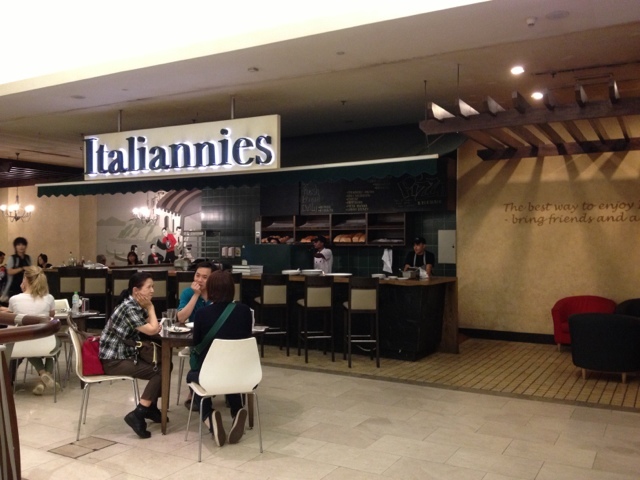 The Gardens Mall Italiannies is quite huge. 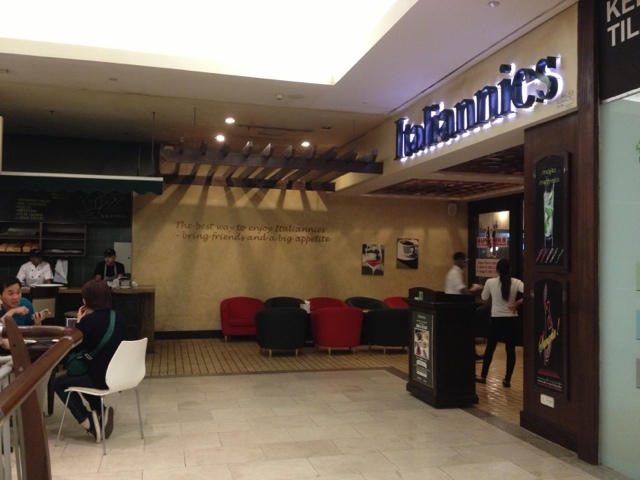 Don't let the outer facade fool you, it looks empty but in fact the inner walls of Italiannies was packed with people and pasta on a Friday night. Mostly we see families with children... enjoying some pizza and pasta. We didn't have to wait long for a seat. There are a number of waiters rushing about the whole place. It was a bit hard to catch their attention as we took a corner seat, but in the end the service was friendly -- as friendly as it can get in the Malaysian context. 2. 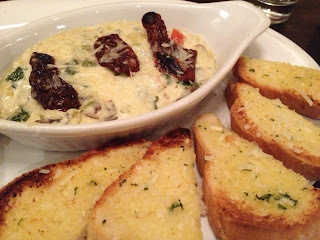 The appetizer which we ordered: the Spinach and Artichoke Formaggio was worth ordering. Especially as hubby likes artichoke (and I don't have a clue how to cook that veggie). It was creamy and it came with well-made toasted garlic bread. It was in fact filling in my opinion. 3. The mushroom soup was creamy and served very hot -- exactly how I like it. I just hate it when we go to restaurants where they serve soup which is not super hot. 4. Friendly waiters - though you could see they were super busy running around, hard to catch their attention -- but when they did come, they were courteous and made an effort to be friendly. Plus points for that, especially in KL. 5. 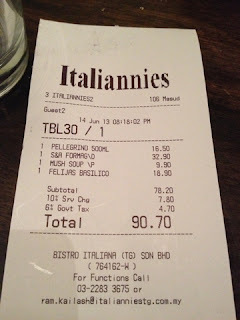 With the Gardens Club card, they gave a RM10 voucher for the next visit. 1. 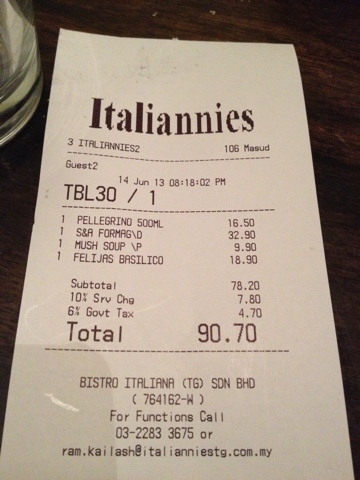 They have this special menu for the month which is called "8 Most Wanted Pastas". We tried the Fileja Basilico -- and we were not too impressed. Maybe because I didn't like the texture of the tube pasta which was kind of weird... the sauce was okay, a bit on the bland side. I had to ask for extra parmesan cheese to spruce it up and it tasted better after that. Also it was not served too hot, and I suspect it was because the waiter forgot to bring it over after it was immediately ready. He did warn us the pasta dish takes 20 minutes (maybe bec the pasta is fresh pasta?)... we didn't mind the wait but I suspect he forgot because he came by and asked if everything was served, only to find out that we didn't get our pasta and he went to get it. 2. Floor was a bit dirty & upkeep of furniture not good-- saw tissue papers splattered on the floor under my seat. I guess they didn't sweep because of the busy Friday night. Some of the chairs had scratches and paint peeled off. Overall it is a good visit. Not too expensive. Recommended for families. 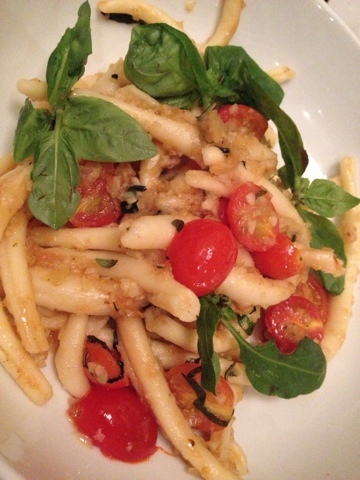 Fileja Basilico - somewhat like tubed pasta with basil and tomatoes - not to my taste. It tasted slightly better after I asked for some additional parmesan cheese. 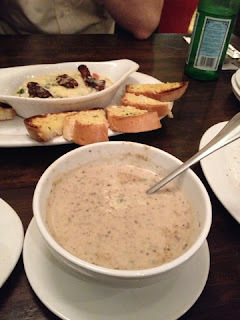 Mushroom soup - creamy, not bad!